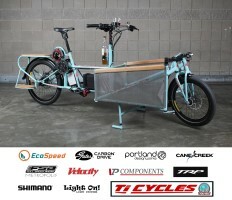 It has been great collaborating with Ti-Cycles on their innovative boxbike/longtail cargo bike! 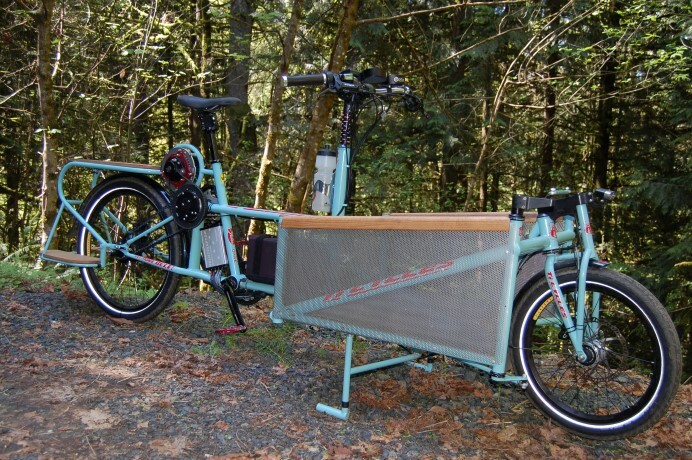 Here are a few extra photos from our collaborative project with Ti-Cycles, a Portland bike builder, introducing the aptly named CarGoAway – Utility Horse. the ram truck of e-bikes. americans will always like bigger is better. 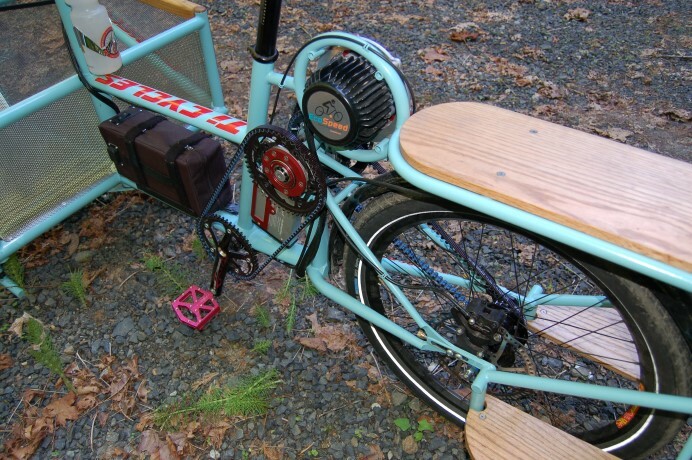 why bother with pedals if you got all this e-power? Riding with the motor is just a blast, this allows many of our customers to move from occasional recreational riders to daily commuters. They still pedal most of the time because they love to ride and get the exercise. 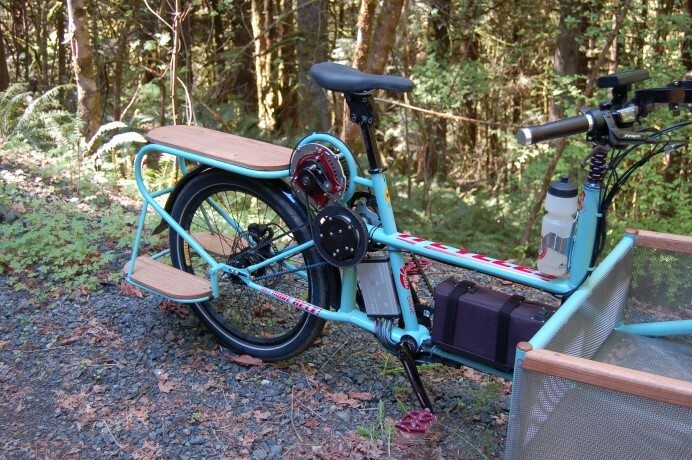 But when it comes to hill climbing with cargo, the electric assist of a mid-drive makes a huge difference. A thing of beauty! The passenger seat is the icing on the cake! Truly I love it!!!! I want one to improve upon, and to present to young people with less petrified/more malleable minds to improve upon even more! With rider, passengers & cargo: there is enough inertia, at even 10kmph, to be worth harvesting instead of turning into waste-heat by means of (I gotta go look at what kinda brakes.) 180 or 185mm disc brakes. The argument that the likes of Lance Armstrong on a bike that weighs 31% less than nothing contains only a minuscule amount of inertia, even at top speeds; simply does not apply to practical cargo-carrying vehicles. 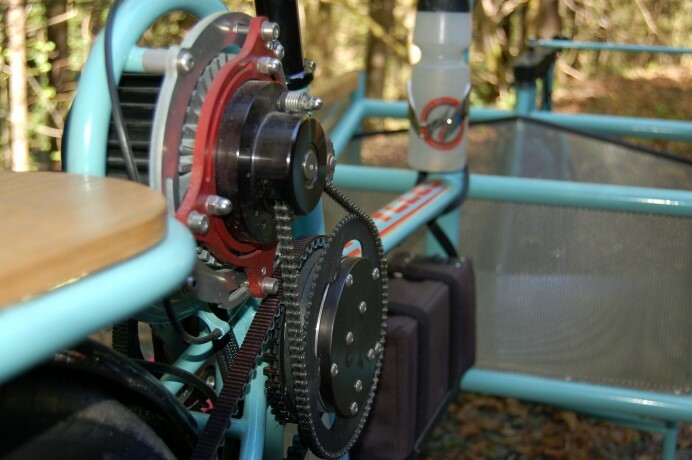 Hybrid-hybrid: pedal/mid drive/hub motor = best of several worlds. Thanks for the kind words John! As the loads increase regeneration can make more sense, like you are saying. If this is running empty it is nice to just keep it lighter and nimble without a larger hub motor. 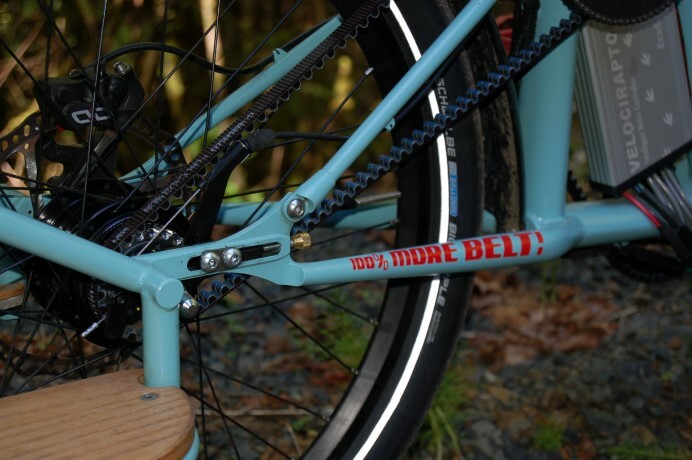 Is there any plan to encase the belt drive and motor? 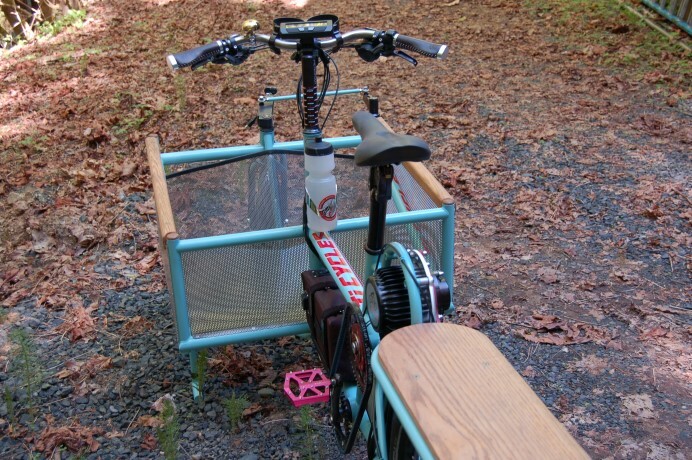 It seems it would be a hazard if you wanted to use this bicycle to carry small passengers, with the one closest to the seat would be very close to the moving parts. Also, I realize that you are promoting electric motor transport, but would there be a possibility of having something like it without the added weight and cost of the motors and batteries. You don’t see many longtail bikes with cargo carriers. What a good looking bike.